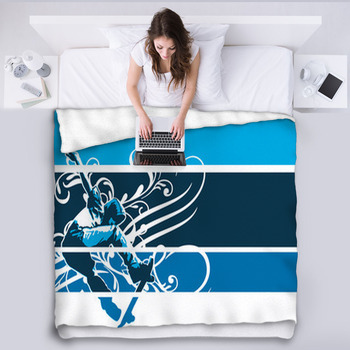 Ride the curve of a crescent moon in twilight skies and let the whimsical side of your passion out on a custom skateboard blanket. 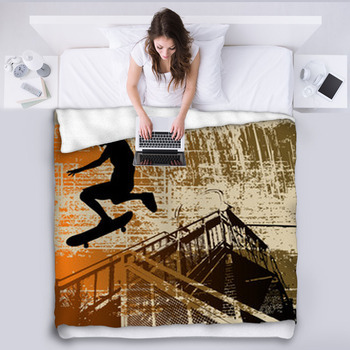 With the same absorption in tone as form, these skateboard designs bring some of your favorite stunts to bed blankets in urban colors and styles. You can kick-flip a board against the radiant light of golden heavens or in the shadows of the back alley behind school. 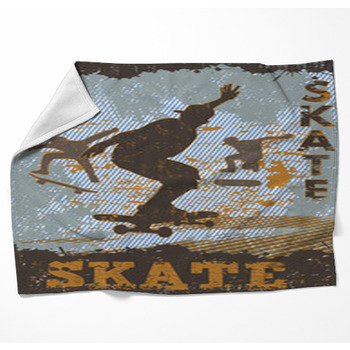 You can stop a skater in the park, just above the top of the ramp against a turquoise sky, and leave him right there on a throw blanket. 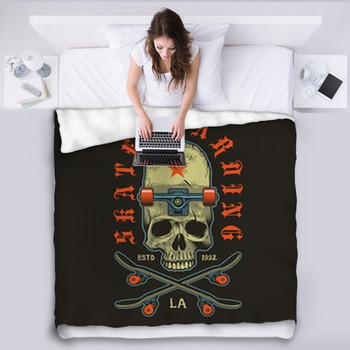 With big air and smooth rides, these skateboard designs leave you feeling like you're skating just beneath the clouds of your custom fleece blanket. 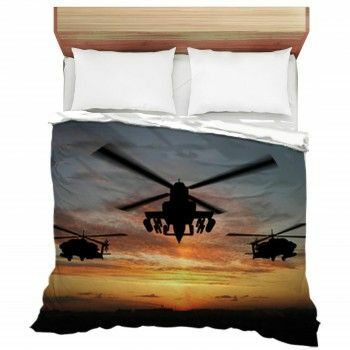 Get ready to touch down on your bed after an awesome glide with an amber sky behind a sweet silhouette of floating form on your blanket. 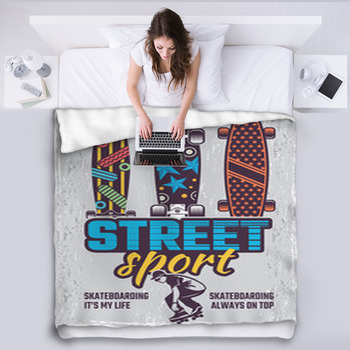 Find that perfect balance with just a slight arc and sweep of rainbow colors around the skater that somehow produce a tunneling rush of urban energy. 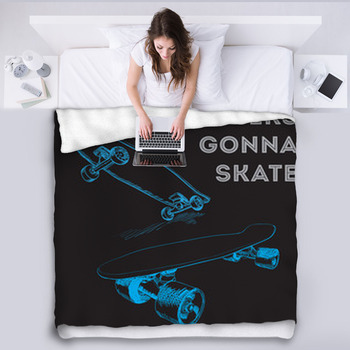 Kick-flip some purple onto the sofa with a skateboard themed throw blanket; or go for a heel flip in mochas with black and white and spin a retro graphic into the room. 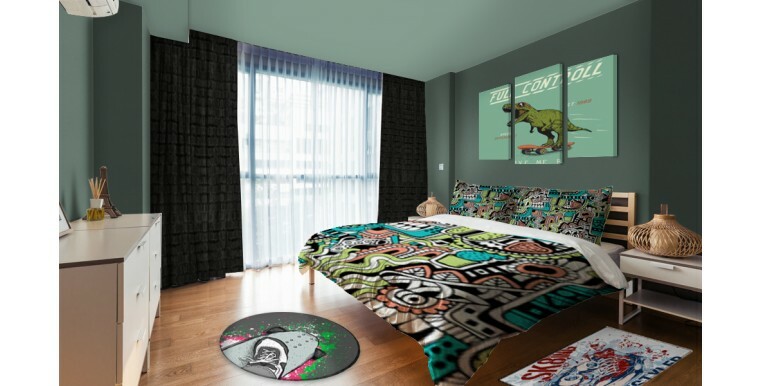 Go ahead and take the Geico gecko to the skate park. 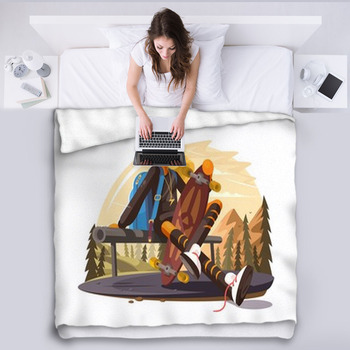 Make a transition happen with a handstand and splotches of paint, or ride out an aerial in panels of color above a city skyline. 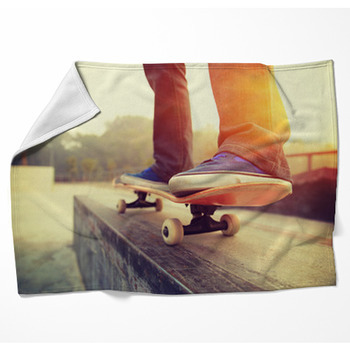 Do a 360 and get under your skateboard with a fleece blanket.